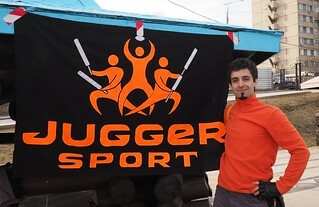 ⇒ Visit our Hall of Fame of the first ones, "Jugger zero", who introduced Jugger to their country. ⇒ Quite current map of Jugger teams and training locations around the globe. So you are very fond of Jugger and put time and love into this wonderful sport. You spread the fascination to others, educate them how to play or how to make good spars. Or you struggle organizing that one big tournament every year that the community loves to attend. Yet, what about motivating your team mates to get a bit more involved in the organizational hassle of Jugger themselves, by making their engagement a bit more visible, so that their work may be appreciated by others? To achieve this, I thought about creating these Jugger merit roundel. They offer a way to show the merits you earn during your Jugger life with an »evolving« emblem, without having to change the roundel itself. So you can print the basic roundel on your jersey in your first year and than just add all that which you achieve over time. Continue reading "Show your Achievements: Jugger merit roundels"
"We gathered some testimonies of female players of Jugger, regarding their experience as women in the sport. This is what they had to say." This is not only a brilliant video, it also fits perfectly: I am currently planning an Uhus Jugger Tutorials about training aspects in regard of teh specific needs of women. If you have any expertise on that, you are welcome to share your knowledge for the UJT. 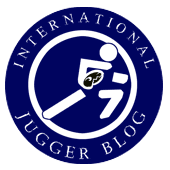 We have started to update and expand the Jugger video link collection at the German Jugger Wiki. If you know good video playlists about Jugger topics (tournament clips, spars making, fighting/playing tutorials), you are welcome to drop us a note. Wonder how to make your own Jugger Pompfe/spar? At Uhus Jugger Tutorials, a playlist on spars making has been launched. Featuring a step-by-step guide on solid rod core spars (shortsword, longsword, Q-Tip, staff), shield making, including different shield core materials like plywood, plastic, EPP and basics on suitable materials, grip and chain making and more. I have prepared a poster for Projekt: Jugger i Sverige which offers an overview over some basic training techniques. It also fits well to my Uhus Jugger Tutorials IIX: Training techniques YouTube video. The draft version, available here, is in English, while the final will be in Swedish and available at the Swedish Jugger Association Svenska juggerförbundet. Fellow German Jugger Gnome has started a blog specifically about training questions in connection with Jugger, for example "How to avoid injuries". He recently published an article about warm-up techniques with some tips that you might consider quite helpful. The Projekt: Jugger i Sverige, together with the Swedish Jugger Association, has recently published training material for spars makers (Baumeister/byggmästare) and for team leaders and referees. They will be used as hand-outs and as a base for the project's workshop in End of September, which will be held at the Största Älgen Svenska Mästerskapet. People often wonder how effective martial arts experience would be in Jugger. Frankly, I don't know. So let's try to apply it. In this video, I transferred Aikido Jo techniques to the Jugger Q-Tip. Jugger often starts thanks to the attachment and sweat of one or a few persons that, against all odds, hold to the thought that there must be Jugger in their country (and, most important, close to them). When Jugger starts rolling in their country, they have rightfully earned a shining title for their achievement: That of the "Jugger zero", or "Juggermaster zero". The name is inspired by their wish that Jugger will spread through the country like a positive kind of epidemic. And first sources of those are also called the "Number Zero". To honour those first ones, here comes the list of Jugger zero's around the world. It is, of course, incomplete and needs your help to be continued—contact us if you know one more, or detect an error or inaccurate report! Also, this "Hall of Fame" will be completed with photos and a more appealing layout, of course.